Yogi Bhajan told us that he himself did not heal. When someone came to him, he called on Guru Ram Das, who did the healing. The following was one of Yogi Bhajan’s mantras that he shared with everyone. It is a great meditation to heal and empower the healer in all of us. By chanting this sacred mantra we embody divine healing vibrations and raise our energy field to the vibration of Love. From this higher state we can easily call upon Guru Ram Das and become a humble servant of the Divine. When we are in a state of ‘All things come from God, all things go to God,’ we can unburden ourselves of ego-based responsibility. Operating from the perspective of being the Creator’s servant relieves a lot of self-inflicted stress and liberates us to live in gratitude. This is a very blissful meditation that activates all your chakras, establishes your spine as your center, and fills your circle with healing energy. When you need help of any kind, chant this mantra. Vibrating this mantra in your spine produces healing, magic, and miracles. I love this meditation! It puts me into a deep connected space. Chant it a minimum of 5-11 minutes every day and consolidate “the feeling” in your body. Chant the designated sound in each of the chakras (see below). 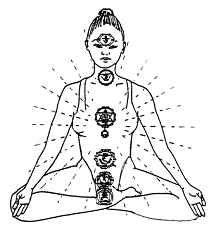 Bring your attention to the specific chakra, but do not move your body. (Tip: GURU is vibrated in every chakra except 3rd and 6th.) Chant for 11, 22, or 31 minutes. Feel your body becoming a golden temple for your soul.